The Morgantown Marriott in Morgantown, WV, is a recipient of an award from SMART Dynamics of Masonry’s recent awards program, “Designing Masonry for All It’s Worth.” The Marriott was recognized for Optimizing Energy Performance. 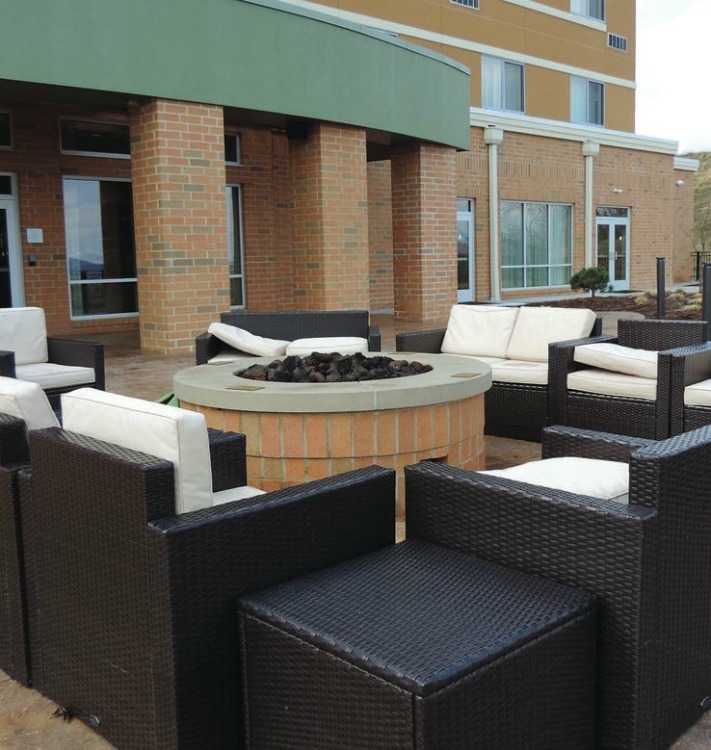 This Courtyard by Marriott hotel, catering to visitors of West Virginia University and its surrounding business community, was built with an energy‐eﬃcient open-end 8-inch concrete masonry unit (CMU) envelope. With the fairly recent modiﬁcation allowances made to ASTM C90, CMU design development has been renewed. An open‐end unit is engineered to reduce thermal bridging by 1/3, as one web is removed. The two remaining webs are now smaller as well. CMU cavity wall and single-wythe building enclosures have always been most economical to construct and the highest performance. Thermal mass is recognized by ComCheck software in modeling performance. And now, we can get an extra 33% in eﬃciency. What’s not to love about that! In addition, use of lightweight aggregate increases this particular unit’s R‐value, contributing to a more thermally‐eﬃcient wall system. Lighter weight CMU also decreased the overall weight of the 5‐story building and allowed for reduced footing and foundation size. The client acknowledged that they sometimes face unfavorable soil conditions and expressed interest in using this block as a solution in future applicable situations. “I suggested we use the new modified A-Block because I know that it was developed to optimize energy performance. I recommend it on every job where the architect wants to enhance energy performance. Today with the 2020 Net Zero Energy Performance initiative, they are all eager to know more about this new block. 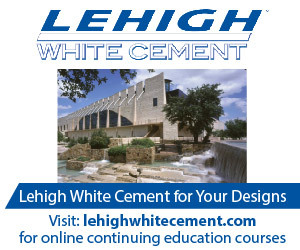 This new CMU enhances energy performance with savings appreciated for the entire lifetime of the building,” says Joe Bonifate, president of operations for Arch Masonry. The carbon footprint related to construction was minimized by completing the structure/ enclosure in less time than scheduled. 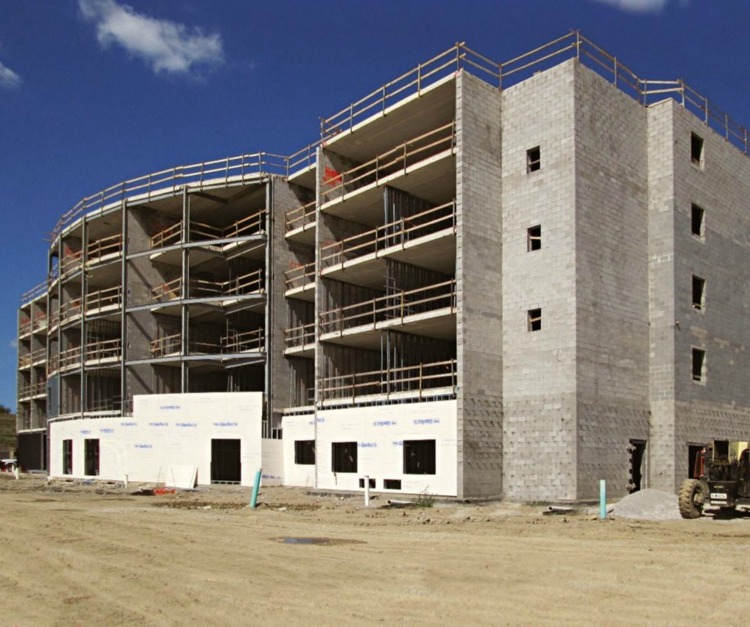 Masons saved one day per ﬂoor, resulting in a week of schedule savings, due to the productivity gains from sliding the open-end CMU around reinforcing bars rather than lifting up and over the bars. The 62,00 sf envelope was erected in just 55 days. Produced within 75 miles of the building site, the carbon footprint of transporting the concrete masonry units is also reduced, along with the associated costs and wear and tear on the roads. Brick is also manufactured within 165 miles contributing to sustainability. Combined with hollow-core precast plank concrete ﬂooring, the hotel is providing safe and quiet accommodations to its guests. The loadbearing CMU enclosure is rated to withstand 115 mph winds for 3‐second gust and has a 1‐hour ﬁre rating. 12″ units in the stairwells have a 2‐hour rating. Anchored brick veneer at the ground ﬂoor provides durability and a welcoming residential aesthetic. This article was reprinted with permission from SMART Dynamics of Masonry. 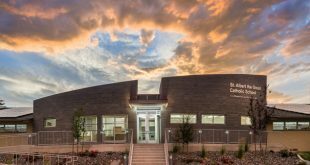 NCMA offers additional resources for designing with energy efficiency in mind. Please be sure to review the Thermal Catalog of Concrete Masonry Assemblies, 2nd Edition in addition to NCMA TEK 2-5B, TEK 6-2C and TEK 6-4B in the NCMA Solutions Center’s TEK library.